it is autostarting. I did not install the FTDI driver, but just to double check is there an uninstaller for the FTDI driver? I might have migrated from an old system. Hey y’all — I’ve got a setup that consists of monomeSerial, a (I think) 2nd or 3rd gen (walnut / aluminum) 128, and Reason. MonomeSerial just connects to Reason and I get a 128 button MIDI input. That’s literally all I use it for. I don’t even bother with getting the lights to work. I recently installed Mojave, and I’m wondering if there’s a compatible version of monomeSerial floating around out there somewhere. Any help would be much appreciated. I think I tried installing SerialOSC a few years back, and I could never get it to work, but if that’s the direction to go, then any help there would be appreciated too. Hope I can get my setup working again! Thanks! I’ve got monomebridge working, but it’s not able to see my 128. I’ve tried disconnecting / connecting, and I’ve checked that serialoscd, serialosc-device, and serialosc-detector are all running. Any idea what else I could try out or should do? Ok, nuked the FTDI, and restarted, SerialOSC is running, and I still can’t see the 128. I noticed in another thread that some people were having issues with SerialOSC and Mojave… @tehn , think they’re related? Hey @tehn, I’ve got serialOSC working, but Reason still isn’t picking up the MIDI. I’ll check on the Reason forums from here, but thanks for the help!!! is there an uninstaller for the FTDI driver? 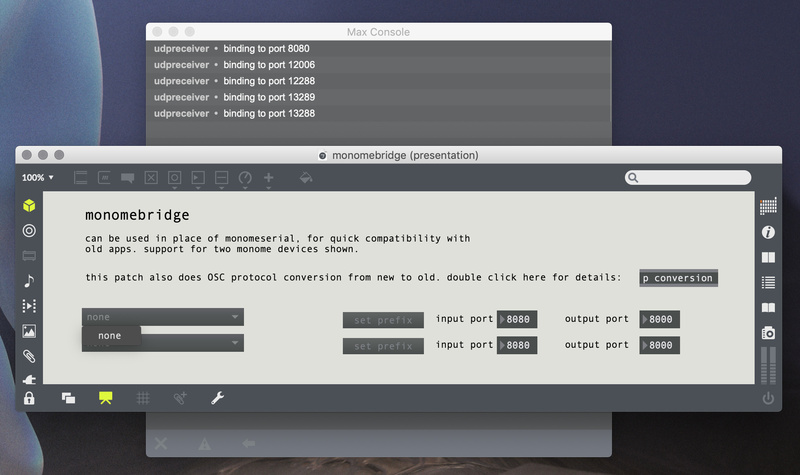 monomebridge doesn’t have midi built-in, and now that you’re asking for that i realize you don’t even need monomebridge. Righteous, got it working! Thank you so much!!! I originally posted in the High Sierra thread that my grayscale 128 is not working. It is still not working in Mojave. Executing serialoscd results in -bash: serialoscd: command not found. However ps -ef | grep 'osc' shows that serialoscd and serialosc-detector is running. When I had High Sierra I tried many combinations of the FTDI driver and am not sure if I have properly cleared all the results of those attempts. My computer is a 2015 Macbook Pro Retina, and I have Mojave 10.14.1. Does anyone have any advice? Ok I’m having a problem I had a couple years ago again. When I fire up Max and connect to a device the first time, works awesome. If I close that patch, I can’t get anything to connect to any monome device again until I quit out of Max and restart. delete that file and see if things improve. that’s the OEM driver. augh. what OS point version are you on? 10.14.1 (though I see a 10.14.2 is out). I’m on Max 8.0.2, but I can also test the problem out on 7.3.5 as well. edit: did some further testing and it all appeared to work right (in both Max8/Max7) BUT it still did fail to reconnect on one of the tries (maybe like 1 in 10 attempts). But after that it was fine. So not sure what’s going on. Let me know if you want me test anything or have terminal spit something out. @tehn - removing /Library/Extensions/FTDIKext.kext did the trick. My grayscale 128 works again. Hooray! grid/serialosc and Max all seem to be working fine here. All software installed today (012919). Grid reconnects fine when changing Max apps.